When in the market for a heat press, it’s easy to be intimated by the massive industrial ones that look best suited for a company, rather than at-home projects. But worry not – you can still press items with a compact machine. The PowerPress HPM-000-PK Heat Press comes with 10 x 12 inch heat plates, multiple safety features, and is very easy to set up and use. But does everyone have a great experience? Some users found cold and hot spots when the plates were heated up, while others had the press fail to reach temperature. To find out if these are rare instances or the popular opinion, let’s take a closer look at the PowerPress HPM-0000-PK Heat Press. Production Dimensions: 17.6 x 13.4 x 8.6 inches. Plate size: 10 x 12 inches. Stand-Out Feature: Auto-shutoff for overheating. The heated plates on this press are 10 x 12 inches. These dimensions allow you to make shirts of nearly any size, as well as baby clothes, cloth journals, and many other items. As long as it’s flat, you’re only limited by your imagination. After the plates are brought to temperature, you can place your item and the image transfer onto the press. Then, secure the top plate over it, set the timer, and press! It’s simplistic and effective, opening up your crafting options. This PowerPress heat press also comes with a touchscreen, located on the top heat plate. This screen allows you to control every aspect of the press, including the time and temperature. When the touchscreen lights up, this notifies you that the press is on; if you don’t see any numbers on it, you can rest assured the press is completely off. The temperature can be controlled by simply pressing the plus or minus button on the touchscreen. It ranges from 0 to 355 degrees Fahrenheit, allowing you to customize the heat levels to suit whatever material you select. Pressing something that needs a lower temperature? The PowerPress Heat Press can do that. Need to crank it up to the highest temp, to ensure your image is really attached to an item? It can do that too. The timer on this PowerPress Heat Press can go from 0 to 300 seconds – or 5 minutes. You can adjust the time with the touchscreen, or on the hourglass button if you want to add more time while pressing. This timer will then beep when it’s finished, allowing you to remove the top plate and retrieve your new creation. This feature means that the PowerPress will know just the right amount of pressure to apply to your projects to get the best results. Its pressure regulating system includes springs that work best with the heat resistant mat to give a uniform amount of pressure to your materials. This means you should have a lower risk of ruining your projects. Worried about overheating? The construction of this PowerPress ensures that can never happen. There are three layers of heat-resistant material to prevent excess heat from leaking out, overwhelming or burning you if you should touch the exterior. PowerPress states that even after running the machine at the highest temperature for two hours, you will only feel a little warmth. If, for unknown reasons, the press does get overheated, it will shut off automatically. Testers loved the large plates on this PowerPress. At 10 x 12 inches, users had enough room to press most of their desired items. With everything from larger shirts to baby clothes to cloth journals, you can press an image on nearly any flat surface without feeling crunched for space. 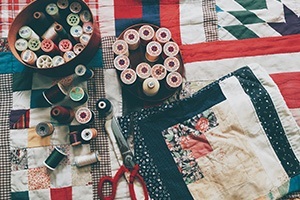 This opens up a variety of projects and items you can get to crafting and allows newer crafters to expand their repertoire without having to upgrade their machine. The size is super convenient too, so while it’s large enough to tackle a variety of creations, it won’t be daunting or overwhelming to have around. Even if you are new to heat pressing, this PowerPress is simplistic to operate. Even beginners will be able to figure it out and make brilliant creations. There’s little to no assembly required, the process is as straightforward as choosing your settings and lowering the top plate, and a timer keeps everything in check. It’s easy and effective! A machine that’s easy to use (and also easy to setup) makes the entire crafting process less daunting. A daunting machine can make an entire craft less desirable overall, causing users to neglect the craft altogether – but there’s no worry of that here! If you’re switching to this machine from a different one, or you’re looking to start a new crafty hobby, the learning curve won’t be hard to handle on this PowerPress Heat Press. PowerPress made sure to include safety features to keep new and experienced crafters safe. Not only is it nigh impossible to overheat, but if the press does come close to overloading, it will turn off immediately and on its own. Once it has cooled down a bit, you can use it again. Additionally, to ensure you aren’t burned by the exterior, no matter its current temperature, there are three layers of heat-resistant material. Not many heat presses include these safety features, causing crafters to be extra careful when tackling projects or when using a machine around children. Having this machine on your crafting table means you’ll have fewer chances of accidents and fewer things to worry about when crafting. Considering the majority of heat presses you see on the market, ‘portable’ is not something you typically expect from these devices. They are big, bulky, and heavy, designed to bring industrial power even to average homes. However, that is not the case with this PowerPress. At only eight pounds in weight, you can easily lift, carry, or otherwise transport this machine anywhere you please. That’s incredibly rare. Whether you want to press in your living room or at a friend’s house, you can easily carry it from one room to the next, to your car, or even to a class. It won’t be too heavy or awkward to handle. If you wish to tuck this away in your closet or cupboard until you need it, it won’t be a hassle either. The size of this machine is near-perfect: big enough to tackle larger projects but small enough to not be a burden. Given the positive comments above, this heat press is a great option for beginners and for those new to the craft. The machine is easy to set-up and use so there won’t be much guesswork and fumbling, and the design is far from overwhelming, making it an easy machine to get accustomed to. The size is another great feature for beginner crafters. You won’t be required to already have a ton of space to get going with this machine, and it will be easy to carry this along with you to classes so you can learn new skills! When you’re a master at the craft, this machine will also be easy to teach others on as well. Sadly, this negative comes to spoil the fun. Testers did report the heat plates failing to reach the proper temperature evenly. More specifically, users found issues with a cold spot somewhere on the plates, either in the middle or off to the side. This made the process of transferring an image onto an item very difficult. Users had to go through multiple sessions, or one part would fuse perfectly, while another part of their transfer image would still be peeling away. This could result in a portion of your creation burning before the other side is done. That’s no small issue, and while creative solutions were formulated by testers, it’s something that can be worrying in a new machine. Speaking of burning, some users did experience burning on the shirts and other objects they were pressing. As a result, their items were ruined and their project halted. This could go back to the uneven heating issue or it could be user error. However, quite a few testers were upset with their experience. A couple of users even measured the temperature at multiple points around the plate and found different temperatures. As such, while one part of your design could not be ready to come out from under the press, another could be in a hot spot and already burned. While this isn’t the most expensive heat press on the market, it still shouldn’t be having these issues. Other testers mentioned the press not reaching temperature properly. As a result, their design would not end up fusing to whatever item they pressed. After one wash, the image would peel off, making all the work they did pointless. Almost all negative aspects mentioned by testers had to do with temperature problems. While the timer is a great feature to include on a heat press, some testers found the alarm to be annoying when using this heat press continuously. While this doesn’t take away from its functionality, those with sensitive ears should be warned. If you’ll be making a number of quick projects, continuous beeping could certainly get annoying. After looking over all the positives and negatives, we recommend the PowerPress HPM-0000-PK Heat Press but do be aware of the issues. With a machine like this, the temperature is one of the most important features. Based on tester feedback, it performs badly and could ruin items you’ve purchased with the intention to modify. That being said, this press certainly looks nice, is compact, and provides nice results when it does work. PowerPress might be new to the heat press crafting scene but they have a number of heat presses available for a variety of users already. They’re catching steam on the market, but it will still prove hard to find the PowerPress HPM-0000-PK Heat Press both in-store and online. While it’s usually best to check crafting and specialty stores, you’re better off kick starting your search on Amazon. That’s the end of our PowerPress review. Tempted to give this heat press a try? The PowerPress HPM-0000-PK Heat Press is easy to use, portable, and versatile, making it an option best for newer and beginner crafters. With a few cons to note, the safety features and LCD touchscreen lend to this heat press' convenient features.